It's always worth noting when a series presents a female character with strength and authority, which is one of the things that stands out in the trailer for Starz's upcoming new limited series drama The White Queen. In the absence of Spartacus - a drama that featured a number of strong female characters - it's great to see another series showcasing a female who doesn't appear to be a damsel in distress, though there's plenty of drama glimpsed in this first official trailer for The White Queen, and more than a hint that some of these female characters will be at odds with one another. Set in 1464 and adapted from Philippa Gregory's novels based on England's War of Roses, The White Queen is a 10-episode series that stars Rebecca Ferguson as Elizabeth Woodville, the future bride of Max Irons' Edward IV, the heir of the House York, which is feuding with the House of Lancaster. Edward is crowned king and soon falls for Elizabeth, who happens to be a Lancastrian commoner. As Starz puts it, this leads to a violent, high-stakes struggle for the crown, which ensues between Elizabeth, her fiercest adversary, Lancastrian Margaret Beaufort and Anne Neville, a pawn in her father's power game. In addition to Ferguson and Irons, The White Queen also stars Janet McTeer as Elizabeth's mother Jacquetta Woodville, James Frain - who plays Lord Warwick a.k.a. The Kingmaker - and Amanda Hale, who plays the mother to Henry Tudor, Margaret Beaufort. 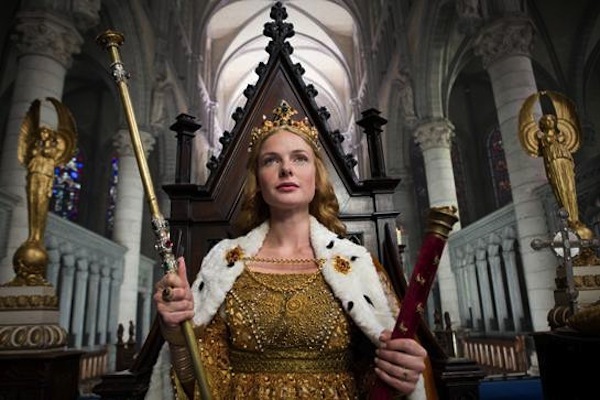 If the series is as dramatic and exciting as the trailer teases, we're in for something good with The White Queen, which premieres Saturday, August 10 at 9:00 p.m. on Starz. It's also set to air on BBC One.